The Therapeutic Recreation & Therapeutic Education Program at Inglis consists of a variety of offerings including: art classes, history lectures, wellness activities, technology services, pastoral care, gardening, music therapy and so much more. An average of 8 programs are offered daily at Inglis and help meet each resident’s social, emotional and physical health needs. Each resident begins with an individualized assessment and, based on their abilities and interests, Certified Therapeutic Recreation Specialists (CTRS) tailor programs and goals, using the resident’s strengths to promote their involvement. Certified Therapeutic Recreation Specialists complete academic coursework at the bachelor’s or master’s degree level and pass a certification examination. The staff often collaborate with other therapists in Speech, Physical and Occupation therapy. 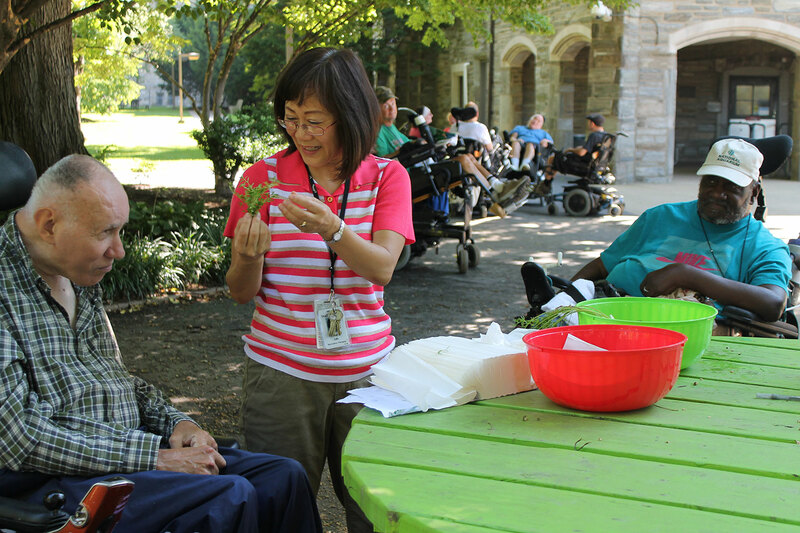 Inglis residents, who are younger than geriatric nursing home residents, have a wide range of engagement needs and are eager to participate in activities that provide a sense of autonomy, mastery and creativity. Seventy-five percent of residents participate in five hours or more of Therapeutic Recration/Education programming per week. Like many services that Inglis provides, these are not covered by Medicare or Medicaid funds. Without donors, we would not be able to offer these programs, which are vital to helping our residents enjoy greater ability and independence.